We’d love your help. Let us know what’s wrong with this preview of Public Relations For Authors Take Hold of Your Own Promotions by Babs Hightower. Getting help to promote your book just got easier. Public Relations for Authors Take Hold of Your Own Promotions will help you locate that special publicist who will help you promote your book the right way. As a Publicity Director for two publishers Babs brings knowledge to the book. Public Relations teaches you why you need a publicist and how to find the right one for yo Getting help to promote your book just got easier. Public Relations for Authors Take Hold of Your Own Promotions will help you locate that special publicist who will help you promote your book the right way. As a Publicity Director for two publishers Babs brings knowledge to the book. To ask other readers questions about Public Relations For Authors Take Hold of Your Own Promotions, please sign up. These days, authors do it all. This is a quick, easy read with practical tips for getting the word out about your book. It has tips that are useful for authors at any stage of the game. If you have written or are writing a book, unsure what to do next, definitely check it out. Even if you think you have it covered, you may pick up something new. Let me say from the outset that this is a short book, but it is pithy and to the point. If you are an author (especially if you are just starting out), I can highly recommend this book to you. It is chock full of amazing ideas for promotions and more. I don't want to give away what is in this book, but I plan to highlight a few things in passing. I am so glad that she made recommendations that I have learned as a blogger. And I have come to appreciate these ideas as well. She explains why authors Let me say from the outset that this is a short book, but it is pithy and to the point. If you are an author (especially if you are just starting out), I can highly recommend this book to you. It is chock full of amazing ideas for promotions and more. I don't want to give away what is in this book, but I plan to highlight a few things in passing. I am so glad that she made recommendations that I have learned as a blogger. And I have come to appreciate these ideas as well. She explains why authors need to go and visit blog posts where there book has been reviewed (this is something that only half of the authors I work with do). She has also encouraged the authors to remind potential promoters in the professional and correct way. And the shocker has to do with how she recommends handling giveaways. I invite all authors to check out her book. And bloggers can benefit as well. It is a simple but definitive resource. Public Relations for Authors is a wealth of information for Authors trying to decide whether they need a Publicist or not, it also provides a lot of information for some DYI Public Relations. This short guide was very informative and provided several do's and don't's that I would have never thought of on my own. It even provided information that should be asked when interviewing perspective Publicists and it was very well written, very clear and precise. The information provided in this guide, t Public Relations for Authors is a wealth of information for Authors trying to decide whether they need a Publicist or not, it also provides a lot of information for some DYI Public Relations. This short and concise guide written by a publishing PR professional provides the often clueless author a means of forming a coherent and sound promotional strategy. Highly recommended. Clearly Babs Hightower has a firm grip on what it takes to promote books and how to guide authors in their promotional quests. Very highly recommended book for anyone looking to push their sales higher in the publicity world. I wish I had this information when I first became an author. It’s perfect to get you started and yet not too overwhelming. It’s an excellent guide not just for the beginners but also for the experienced one that need reminders here and there. A book blogger gives promotional advice to authors gained through years of her experience. Some information is spot on and other pieces are interesting. Blog tour advice is quite accurate and, if followed, would be helpful for all parties. The advice on guest posts is spot on. I cannot remember a time where I have turned down a guest post and the only reason would be if the genre did not match my blog’s brand. This is not PR For Dummies by any means. This is a practical guide for authors looking f A book blogger gives promotional advice to authors gained through years of her experience. This is not PR For Dummies by any means. This is a practical guide for authors looking for advice on how to promote their book. It covers a lot of ground in a few short pages. Even if you have a strong framework of the subject, you might still find yourself googling topics after reading this. The author did not explain how public relations might fit in with your overall marketing plan nor explain the difference between marketing and PR. When reading this, you should already have a strong grasp of those concepts. Marketing concepts are missing here. Basic ones like selecting your target audience would steer some of the advice here in a slightly different direction. I would have liked to have seen this more textbook-like than what it was, explaining and teaching the reader more about the subject. Still, if you are a brand new indie author wondering where to begin, this does give some helpful information and is a place to start. Google can only help you if you know what to Google. In that sense, this can be useful. It took 20 minutes to read. I don’t regret reading it. This is a book that all authors should have on their shelves. As an author myself, I have witnessed many good authors who go unnoticed because they simply do not have the tools to promote their work. Babs Hightower has written a concise, easy to follow, how-to guide for authors, and if you are an author, you need this book. Not only does Babs give step-by-step instructions, she provides examples of press releases, press kits, and all the related materials every author needs to sell their book. I e This is a book that all authors should have on their shelves. As an author myself, I have witnessed many good authors who go unnoticed because they simply do not have the tools to promote their work. Babs Hightower has written a concise, easy to follow, how-to guide for authors, and if you are an author, you need this book. I especially appreciated how Babs covers modern 21st century social media. In today's world, online media is a new author's best friend. At the same time, she takes a chapter to remind authors about the advantages of Radio appearances and interviews which is something new or young authors often overlook. To do the PR work yourself, or to hire a PR agent? Babs helps authors with both of these questions by offering instruction for the do-it-yourself author, as well as writing about what to look for and how to find a good PR agent. Too many good authors write an excellent book that is overlooked because they simply hand it off to the publishing house and do nothing else. In today's world, authors must be more visible and work hard at public relations to establish a readership. 'Public Relations for Authors' is quite simply one of the most important reference tools any author can have in their quest to become successful. I’ve been blogging about books since last year. During my journey, I’ve learned that the viva voce is an influential tool. Because of this, as a book blogger, I always try my best to spread the word about indie authors and their new book. Having issue regarding book promotion ideas? Every author knows that public relation has a significant role to play in the writing business. Where to find a PR agent? How much do I need to spend? This is where Public Relations for Authors Take Hold of Your Own P I’ve been blogging about books since last year. During my journey, I’ve learned that the viva voce is an influential tool. Because of this, as a book blogger, I always try my best to spread the word about indie authors and their new book. Having issue regarding book promotion ideas? Every author knows that public relation has a significant role to play in the writing business. Where to find a PR agent? How much do I need to spend? This is where Public Relations for Authors Take Hold of Your Own Promotions comes in. I have to say, while it is only 30 pages, this book has opened my eyes. I learnt the importance of book publicity (a well written book is never enough) and even the perfect gifts (surprise!) for a book giveaway. I was not expecting this. Every author should own this book. It’s short but insightful. Authors out there who probably wish they do not need to spend a good amount of time reading about public relations? No excuse for you now. My 10 minute was very well-spent, indeed. Hopefully, with my new perspective, I’ll be able to help authors achieve exponential success. Public Relations for Authors: Take Hold of Your Own Promotions is a very eye opening short book. It's packed full of useful and helpful knowledge that all authors should have available at their fingertips. Public Relations for Authors contains detailed instructions that all authors, new or established, can learn from, and also includes samples of pitches, press releases, and media kits. Social media is discussed, as well. Social media is very important when networking and promoting you and your b Public Relations for Authors: Take Hold of Your Own Promotions is a very eye opening short book. It's packed full of useful and helpful knowledge that all authors should have available at their fingertips. Public Relations for Authors contains detailed instructions that all authors, new or established, can learn from, and also includes samples of pitches, press releases, and media kits. Social media is discussed, as well. Social media is very important when networking and promoting you and your books. But don't spam-this turns people off. Babs also includes the benefits of radio publicity. Also included are various types of other means of publicity and how to work with them. 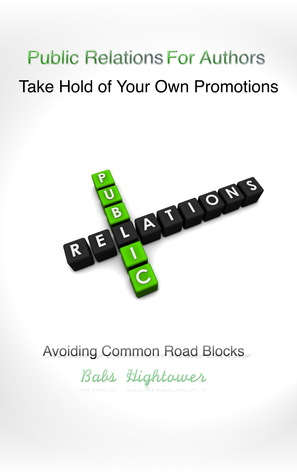 She also includes the how's and why's to hiring a Public Relations (PR) Specialist. There are also tips that can help bloggers assist authors as they travel the publicity road for the first time or the hundredth time. This book can also assist bloggers themselves to become better, more efficient hosts for the multitudes of authors and genres of books currently in the marketplace. I learned a lot about the entire process of book promotion that will help me, as a blogger, help you, as the author. So, you've written a book. Congratulations! That's no small thing. Lots of people talk about writing a book. Some even start, but you finished! Now what? That's right. I asked you about your next step. I don't want to be a downer, but writing the book was the easy part. Not to worry. Babs has some helpful tips, hints, and answers for those sort of questions. This is a short, easy to read manual of what to do after you type The End. PR and marketing are essential to getting your book to sell. She So, you've written a book. Congratulations! That's no small thing. Lots of people talk about writing a book. Some even start, but you finished! Now what? That's right. I asked you about your next step. I don't want to be a downer, but writing the book was the easy part. Not to worry. Babs has some helpful tips, hints, and answers for those sort of questions. This is a short, easy to read manual of what to do after you type The End. PR and marketing are essential to getting your book to sell. She provides information helpful to authors of every genre and skill level. With a few time saving tricks, you can get ready to blog tour, book sign, and promote yourself and your book. Remember, the book is the product. You're the brand! And Babs helps you market both! Babs Hightower became a publicity director in December 2012 for Entangled Publishing. This mini read deals with authors who may have published a book but don't know how to get the word out. The book is a step by step guide of what a publicist could and should do for you. There are some great tips in this book too. One relates to bloggers who've hosted you on a blog stop. Stop by and say "Thanks for having me". Believe me, being a blogger, this does not happy very often. The book talks you through Babs Hightower became a publicity director in December 2012 for Entangled Publishing. The book talks you through getting reviews for your book too. It is a really informative guide, going through radio publicity; book stores and much more, with lots of examples for you to follow. There are examples on how media kits could look and what to include in a media kit; how books are publicized and what questions you should ask of a potential PR person. This book briefly covers some of the mos I received a copy of this book from the author of an honest review. This is a short and to the point guide many authors out there can learn a lot from. It gives a sense of what to expect and a boost of confidence from reading it. Knowing a better idea of what should and should not be done when doing PR. I've learned a couple of things that have never even crossed my mind. Especially prep wise. There are even a few examples within Public Relations for Authors that are in easy to understand and read formats. I feel those examples provided help ease the stress, tens This is a short and to the point guide many authors out there can learn a lot from. It gives a sense of what to expect and a boost of confidence from reading it. Knowing a better idea of what should and should not be done when doing PR. I've learned a couple of things that have never even crossed my mind. Especially prep wise. There are even a few examples within Public Relations for Authors that are in easy to understand and read formats. I feel those examples provided help ease the stress, tension and pressure that builds as you think about actually doing the PR. This is a handy guide designed to help authors, especially new self-published authors, understand the role of the book publicist. It is a quick, easy, informative read, including handy tips on how to conduct yourself on a blog tour. The author makes the interesting point (in relation to giveaways), "I cannot stress enough DO NOT giveaway your book for the prize," but suggests giving away a gift card instead. While the information provided is timely, the graphics are too small and unable to be enl This is a handy guide designed to help authors, especially new self-published authors, understand the role of the book publicist. It is a quick, easy, informative read, including handy tips on how to conduct yourself on a blog tour. The author makes the interesting point (in relation to giveaways), "I cannot stress enough DO NOT giveaway your book for the prize," but suggests giving away a gift card instead. While the information provided is timely, the graphics are too small and unable to be enlarged. The text would also benefit from the inclusion of hyperlinks to some of the organizations mentioned. There are numerous formatting and editing errors, although I may not have been reading the final version. Nevertheless, this is a great resource for all authors. A practical, step by step book that helps you find the correct publicist, when publishing a book. Which direction to follow when you market the book and how to approach said avenues. Easy to follow steps that shows you how to create your profile and media kit, the most important thing other then the book itself. Questions you should ask when requiring the services of a PR. A great tool for all authors. I thought that this book was going to be a resource for authors who want to publicize their book on their own. It actually explains what to expect from a publicist and what the author can do to help the publicist promote their book. This is a great resource for any author who is using, or is planning to hire, a publicist. Of course this is my own book , but it does have a lot of information that can help all authors. Hope you give it a try. Excellent guide for the beginner author as well as the experienced one. Ms Hightower covers all aspects of Public Relations for the author in language that anyone can understand. CEO/ Owner of the magazine Babs BookMark & blog, Babs Book Bistro. Babs Hightower has been helping authors since 2000. She owns a book review blog Babs Book Bistro which got her started in PR and helping authors promote themselves.